Sugarloaf Mountain is a small (1,282 foot; 391 m) mountain and park about 10 miles (16 km) south of Frederick, Maryland, USA. The closest village is Barnesville, located nearly at the foot of the mountain. 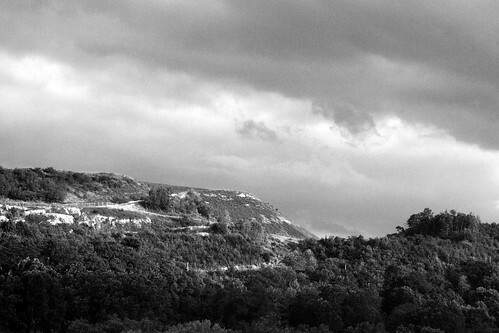 The peak of this relatively low mountain is approximately 800 feet (244 m) higher than the surrounding farmland. Because of its geological and natural history interest, it was designated a National Natural Landmark in 1969. It is a notable example of an admission-free, privately-owned scenic park. via Sugarloaf Mountain (Maryland) – Wikipedia, the free encyclopedia. 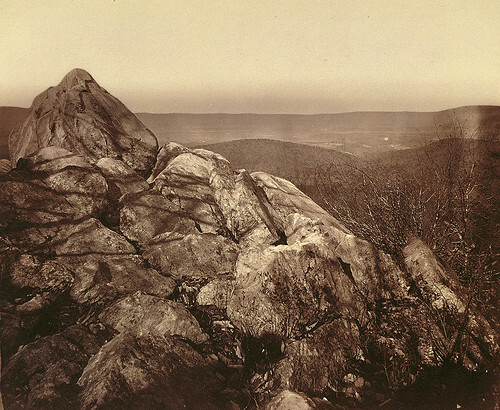 It was the photo’s in the last post that led me to doing more research about Sugarloaf Mountain. Sugarloaf Mountain has been designated a Registered Natural Landmark because of its geological interest and striking beauty. Stronghold agreed to maintain its natural state, and your help in this regard will be a most welcome contribution. via Sugarloaf Mtn., Dickerson, MD. Coast and Geodetic Survey Station on Sugarloaf Mountain, Maryland, n.d.
Somewhere in Maryland, I think. Almost 810 feet of strata in a tightly folded syncline are exposed in this road cut.